DDR3 1333 Mhz BGA CHIP POGO PIN Tester with UNIVERSAL SOCKET TO TEST ALL DIFFERENT DDR3 Chips with or without Solder Balls. CST Inc., a 28 years privately owned memory tester company, announces its New SP3000-DDR3 CHIP tester today to test the New DDR3-1333/1066/800 memory chips. 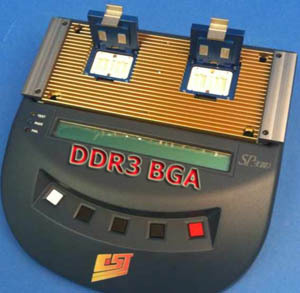 This makes it the first low cost real time tester for screening regular DDR3 DRAM as well as UTT DRAMs. The Key feature of the Pogo Pin Tester is its ability to test DDR3 BGA Chips without Solder Balls. The “SP3000 DDR3 Chip POGO Pin Adapter” is built to work with the CST SP3000 base tester, which allows user to swap inter-changeable DDR2, DDR, SDRAM & DRAM test adapters. With a simple push-button the SP3000-DDR3-Chip tester quickly auto-identify and displays the memory size, clock frequency, and speed of the memory chip. Unlike DIMM shape chip converters that can give uncertain test result, the SP3000-DDR3 POGO Pin Chip Adapter test sockets are fully buffered and isolated for “no confuse” fault detection. The new “SP3000 DDR3 POGO PIN Chip” tester provides added troubleshoot capability for the present and future DDR3 memories at affordable prices. It is targeted for the memory module manufacturers. It is indeed the fastest tester and the easiest to use in its class. An advanced PC software is available for interfacing to a PC. Click here to download a copy of the product brochures. Founded in 1983, CST develops, market, and support computer memory tester software and hardware. CST pioneered the first low cost SIMM tester in 1985. Since then, CST testers have become the standard for the computer manufacturing industry, holding more than 70% of the market in testers for computer manufacturers and third party SIMM manufacturers. With its product lines of SIMM/DIMM memory testers and handlers, CST is equipped to handle all aspects of memory testing. CST has a comprehensive line of testers ranging from the low-volume service tester to the high-volume manufacturing needs. CST, Inc. headquarters in Dallas, Texas, USA also has direct offices in Singapore, California, China as well as global distributors strategically located in Australia, Brazil, Canada, China, France, Germany, Hong Kong, Japan, Korea, Switzerland, Sweden, Singapore, Taiwan and the United Kingdom. For further information, visit www.simmtester.com or call our Sales at (972) 241-2662.